Advanced Placement (AP) courses, administered by the College Board, are college-level classes in six academic areas that students can take while in high school. Those who opt to take the year-end AP Examinations can also potentially receive college credit. Once students commit to John Carroll and submit their enrollment deposit, they should request that their AP test scores be sent directly from the College Board to John Carroll for an official credit evaluation. Click here to see current departmental practice for AP tests. The International Baccalaureate (IB) Diploma Programme prepares high school students for success at the university level. The academically challenging, internationally focused curriculum includes courses in six subject areas. Students taking year-end IB examinations can also potentially receive college credit. Once students commit to John Carroll and submit their enrollment deposit, they should request that a transcript from International Baccalaureate North America (IBNA) be sent directly to John Carroll for an official credit evaluation. John Carroll accepts Higher Level (HL) course work only, except as noted. Click here to see current departmental practice for IB exams. John Carroll University grants credit for college-level classes that a student completes while in high school. Credit will be accepted from regionally accredited institutions as long as students achieve a grade of “C” or better. 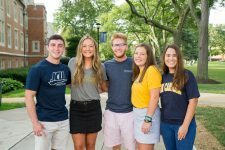 Once students commit to John Carroll and submit their enrollment deposit, they should request that an official transcript be sent from the college(s) at which the classes were taken directly to John Carroll for an official credit evaluation. Click here to read more about CCP/PSEO/CIHS as well as other college credit options.